In EA Sports' annual simulation of the celebrated American football contest, the New Orleans Saints narrowly defeated the Indianapolis Colts in Super Bowl XLIV by a score of 35-31. Every year since 2004, EA Sports runs a simulation of the Super Bowl using the team's current roster and statistics. The simulation has correctly predicted the outcome of five out of the last six Super Bowls, including last year when it was prescient enough to know the score plus or minus 1 point and even nailed a few individual statistics. 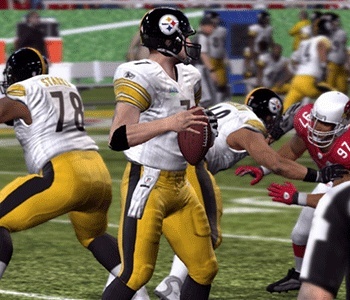 This year, the Madden 2010 simulation accurately predicted who would win both the AFC and NFC Championship games and their final scores within a margin of only 3 points. If the simulation is correct this year, the Super Bowl looks like it's going to be pretty entertaining. It may even draw your attention away from the advertisements and the Nachos Supreme, for a little while anyway. After 3 quarters, the Saints only led by 3 points, 24-21. Despite a passing touchdown by Peyton Manning to Joseph Addai, the Saints prevailed in the fourth quarter due to a Reggie Bush 42-yard punt return for a touchdown and Drew Brees hitting David Thomas for an 11-yard touchdown pass. Final score: 35-31 Saints. Brees wins the MVP. In related news, the 16th annual Madden Bowl goes down tonight on Xbox Live. 8 NFL players meet up to play a single elimination tournament in Madden 2010 on the Xbox 360, with this year's field including Chad Ochocinco (Cincinnati Bengals), Chris Johnson (Tennessee Titans), Maurice Jones-Drew (Jacksonville Jaguars), Jared Allen (Minnesota Vikings), Andre Johnson (Houston Texans), Patrick Willis (San Francisco 49ers), Miles Austin (Dallas Cowboys). Noticeably absent from that list are the last two year's winners, Baltimore Ravens Willis McGahee and Tampa Bay Buccaneers receiver Antonio Bryant. The throne is empty. Who will be crowned the king of Madden Bowl 2010? And will we see any player transfer their Madden skills to the real game?